The Chilcotin plateau lies between the Rocky Mountain range and the Coast Mountains, on Canada’s west British Columbia coast. The region is a vast wilderness, surrounded by undulating mountains and peppered with lakes, glaciers and ice fields. In winter, the nearby Coast Mountains are famous for heli-skiing, in summer however, this is the place to come hiking through some of the country’s most scenic landscapes. The area around Anahim and Nimpo Lake is a particularly popular location for people who want to go a little bit backcountry and combine camping, kayaking and hiking. 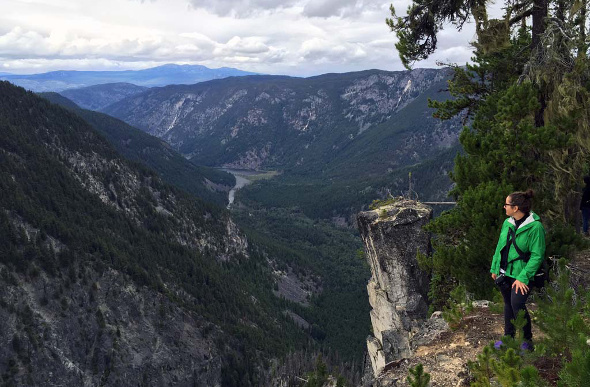 Here you’ll find a number of well-maintained hiking trails and campgrounds, accessible by floatplane (or a long hike) and there are also canoes available at some campgrounds so you can explore the area’s many rivers and lakes. The most popular canoeing route is the Turner Lake Chain, which takes in seven lakes. Starting at Turner Lake, the route takes in Cutthroat Lake (named after the cutthroat salmon stocked here), Vista Lake, Junker Lake, Widgeon Lake, Kidney Lake and Sunshine Lake. 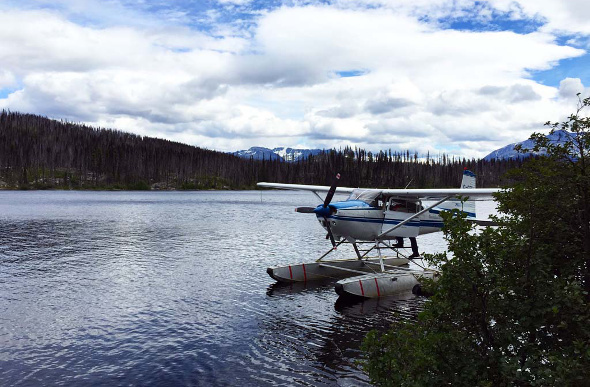 It’s possible to hike up to Turner Lake from the Bella Coola Valley along the Hunlen Falls Trail, but most people (including us) choose to fly into Turner Lake, where canoes are stored lakeside, and paddle up to Junker or Widgeon Lake to set up camp. The seven lakes have short linking creeks and easy portages, forming a j-shape as they wind through the mountains. Views become progressively more spectacular, with the glaciers and knife-edge ridges of the Talchako Range coming into sight as you paddle up the route. Our flight here is spectacular enough, taking in several lakes, glaciers and waterfalls along the way and giving us a good idea of the lay of the land we’ll be hiking through. 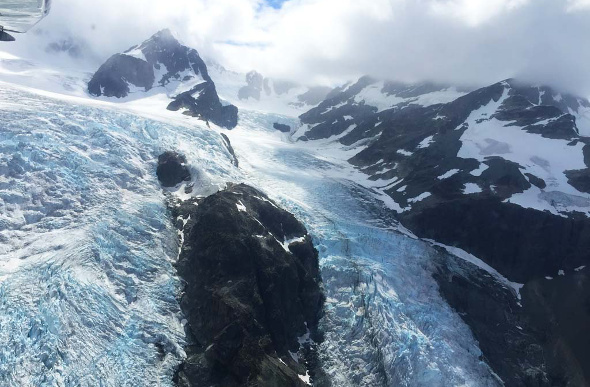 We depart Nimpo Lake in a small floatplane and fly over dense evergreen forests before heading up and over the snow-capped mountains, getting an up-close look at Monarch Ice Field and the Talchako Glacier along the way. Finally we loop around for a birds-eye view of Hunlen Falls and land on Turner Lake, one of the smoothest landings I’ve ever experienced in an aircraft of any size. From Turner Lake campsite there are a number of short hiking trails within easy access, including a short loop across a bridge at the northern end of the lake, past spectacular views of the sheer, 260-metre drop of Hunlen Falls and on to a lookout high over Lonesome Lake. Just north of the campground there is a longer trail which climbs 7.5 miles through mature pine forest to the sub-alpine, and Ptarmigan Lake campground which can be used as a base to explore the Panorama Lakes Loop Trails. There is a choice of three loops from Ptarmigan Lake, one 8.5-mile trail past Echo Lake and Rosemary Pass, another 8.5-mile trail by Molly Lake and through Rosemary Pass and a combination of the two, which is 13 miles long. All three hiking trails are rated ‘moderate’ but the combination trail makes for a long day and we are advised only to attempt it if we’re feeling super-fit (and experienced). Not having a full day to explore the longer trails, we opt for a view of Hunlen Falls and Lonesome Lake before returning to Nimpo Lake for a slap-up meal at our cozy lakeside lodge. The views along our short trail are just as spectacular as those from the plane, with the Bella Coola Valley far beneath us, and mountains in every direction, all the way to the horizon.